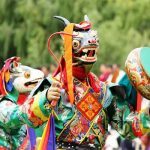 At various times throughout the year, annual festivals known as “tsechus” take place around the country, but there are other festivals too. 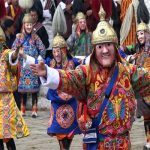 Tsechus are festivals extolling the great deeds of the Buddhist Saint, Padmasambhava, popularly known as “Guru Rinpoche” in our mountain kingdom. 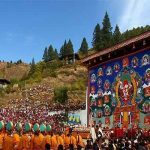 All of Guru Rinpoche’s great deeds are believed to have taken place on the 10th day of the month, which is the meaning of the word tsechu, and all tsechus do in fact take place/begin on 10th days. 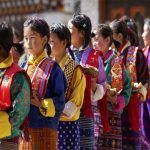 All the districts, dzongs and a large number of villages in the east, hold annual tsechus, which attract people from far and wide. 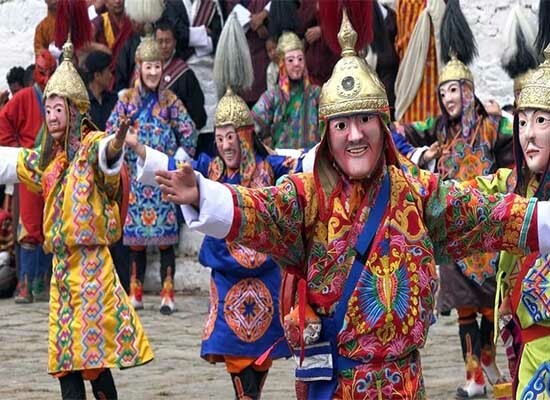 Tsechus are celebrated for several days (usually between three and five, depending on where it is taking place) and are the occasion for dances that are clearly defined in religious content. 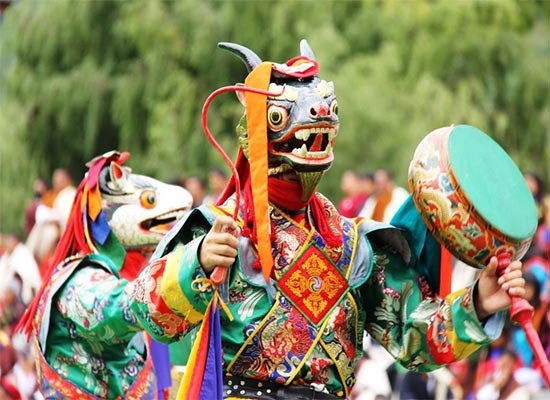 They can be performed by monks, laymen or gomchens and the repertory is more or less the same everywhere. Certain tsechus end with the veneration of a huge appliqué thangkha, called a “thongdroel”. The thongdroel is unveiled at dawn to bring enlightenment to all who view it. Festival goers believe that by simply viewing this thongdroel, they can be delivered from the cycle of birth and rebirth, which is the ultimate aim of Buddhism. Some tsechus also have a “wang”, a collective verbal blessing given by a high lama. Colored threads are distributed, and people tie them around their necks as witness to the blessing. Sometimes the wang is called “mewang” meaning “blessing by fire” which burns away their impurities. 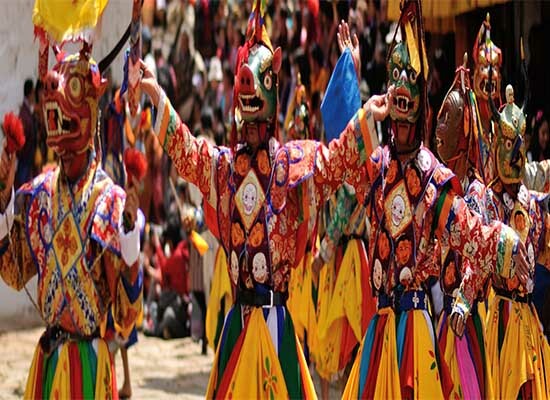 Atsaras are clowns whose expressive masks and postures are an indispensable element in any religious festival. 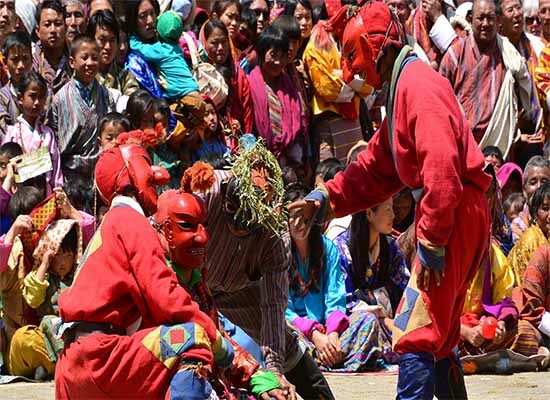 They confront the monks, toss out salacious jokes, and distract the crowd with their antics whenever the religious dances begin to grow tedious. Believed to represent Acharyas, religious masters of India, they are the only people permitted to mock religion in a society where sacred matters are treated with the highest respect. For a few days, these popular entertainers are allowed the freedom to express a formulaic challenge within an established framework that does not, however, upset the social and religious order. Some religious festivals include only a few dances and consist mostly of readings from a particular text. On these occasions, villagers assemble in a temple and participate in the prayers while at the same time drinking strong alcoholic beverages. 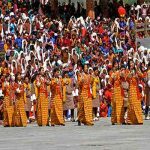 Each village takes pride in its annual religious festival, and any villagers who have gone to live in the city are usually expected to come back home for it. Such villagers will themselves sponsor a large part of the cost of mounting the festival. 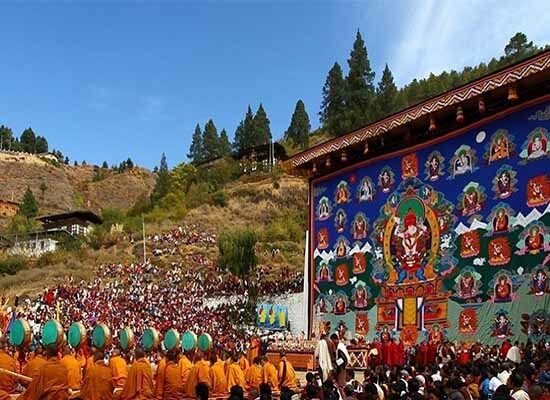 For the Bhutanese, attendance at religious festivals offers an opportunity to become immersed in the meaning of their religion and to gain much merit. 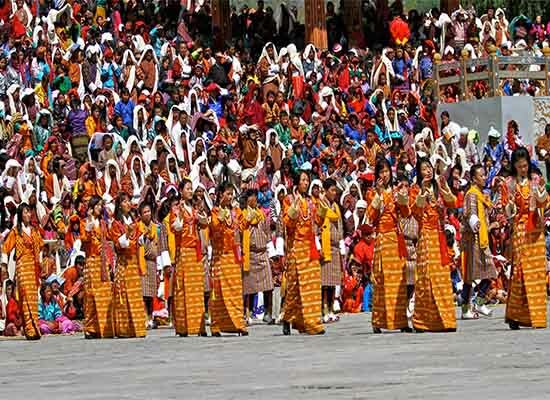 The festivals are also occasions for seeing people, and for being seen, for social exchanges, and for flaunting success. People bring out their finest clothes, their most beautiful jewelry, and enjoy picnics with abundant alcohol and meat. Men and women joke and flirt with one another. An atmosphere of convivial, slightly ribald good humor prevails. 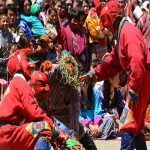 Village Festivals: Many small village festivals are held in the winter months. The weather is very settled across Bhutan at this time of the year. The clear blue skies and crisp air offer splendid opportunities for the committed photographer, especially for those using slide medium. Please contact Etho Metho for dates/places of forthcoming winter festivals. 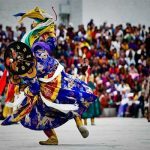 A winter journey to seldom visited eastern Bhutan, with participation in such a festival, would be an unforgettable experience. Festivals are religious events. 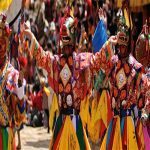 The ground where they are held is purified and consecrated by lamas, so when you are watching a festival you are, in essence, on the perimeter of an outdoor religious ground. The conduct of the onlooker should be governed with this in mind. 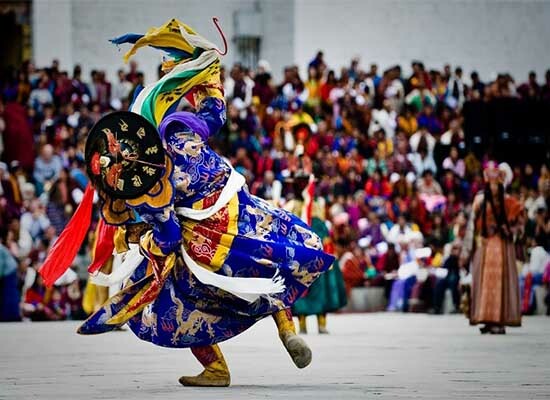 The dancers, whether monks or laymen, are in a state of meditation. They transform themselves into the deities which they represent on the dance ground. They generate a spiritual power, which cleanses, purifies, enlightens and blesses the spectators. With this in mind, it should be clear that obtrusive, disrespectful or discourteous behavior is out of place. Remember, too, that smoking is not permitted in public places in Bhutan. The dance ground is not a place to eat, drink, talk or laugh loudly at inappropriate times, flash cameras or intrude on the dance space. Common courtesy should rule one’s action when photographing dances or onlookers. Festivals are not pageants or entertainment events. They are not held as tourist attractions. They are genuine manifestations of religious traditions thousands of years old which outsiders are given the privilege of witnessing. We would like to see that privilege retained, without in any way impairing or infringing on the beauty and sacredness of the ritual. Please bear in mind that some past actions of unthinking visitors have caused shock and dismay to the local people. Any recurrence of such unfortunate events may lead to future restrictions on attendance at festivals. 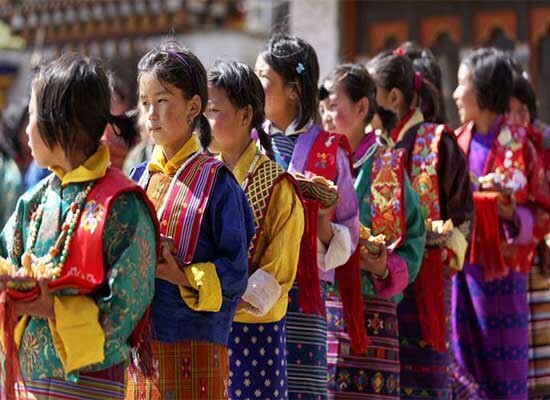 We hope that our tour members will always display courtesy, sensitivity and respect to the people of Bhutan who have welcomed them to attend these beautiful and sacred events, and will visibly demonstrate their respect by dressing as well as their circumstances permit on such occasions.